Vision Systems GmbH - released next ARM 9 RISC embedded industrial computer, OnRISC Alena. Vision Systems GmbH - Industrial PC provider, announces the release of the next ARM 9 RISC embedded industrial computer - OnRISC Alena. This model is a new member of the OnRISC family. Like the initial Alekto it is based on an ARM9 RISC CPU and runs the full-featured Debian GNU/Linux operating system, based on Kernel 2.6. Alena is suitable to cover control and networking applications for industrial control, transportation systems, environmental monitoring and small office servers. 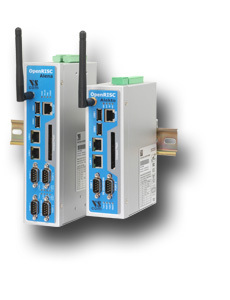 Many interfaces, like LAN, USB, I²C, serial ports RS232/422/485, digital I/O and MiniPCI-Slot, make it easy to connect various industrial devices to the OnRISC systems. The Alena adds CAN (…) to the supported interfaces, and offers two additional serial ports compared to Alekto. Two digital I/O signals are isolated inputs, two other are relay outputs. The other four signals behave bi-directional as in the Alekto. OnRISC systems run full-featured Debian GNU/Linux on ARM operating system including all device drivers for peripherals. This Kernel has better support for USB devices, handles the Watchdog Timer of Alena and Alekto, and provides the udev file system for devices. Many other new features can be read in the public Linux documentations. ARM9 32-bit RISC CPU (166MHz) and 64MByte SDRAM memory allow the OnRISC systems to provide high performance for data processing. OnRISC Alena and Alekto are ready to be DIN-Rail installed and feasible to fit even strong limited space environments. OnRISC Alena has very small power consumption and needs only 6.5 watts. Working reliably in a wide range temperature from -10°C to 65°C, OnRISC systems can be used practically almost everywhere. One Application field for OnRISC embedded computers is intelligent networking of the production tools, such as NC-Machines, PLC-Controllers and I/O controllers. These devices can be usually accessed only via RS232/422/485 or over Digital I/O. Field busses may be attached to RS485 or CAN. OnRISC Alena directly interfaces these devices via serial ports or Digital-I/O, at the same time via Ethernet it acts as a Gateway to higher computer instances, such as monitoring and/or control workstations. Without contact to such workstations OnRISC systems can supply the manufacturing devices with production data on demand, download their programs, can buffer data from/to those devices, run maintainance tests or perform data protocol conversions. The internal SD reader as mass storage for boot can separate the operating system and application or configuration files from production data such as protocol files or NC programs on the Compact Flash card. The system is protected then against accidentally removal. Administrators are free to decide for their configuration, and use the Compact Flash slot to upload new data and configurations, where a network is not available. CAN: OnRISC Alena connects to CAN networks. For developing applications the known VSCAN API is provided, which allows similar programming as with other CAN adapters available from Vision Systems. This API also supports CANFestival, an Open Source CANopen Framework. CANopen is a CAN-based higher layer protocol that is used in various application fields, such as medical equipment, offroad vehicles, maritime electronics, railway applications or building automation. CANopen unburdens the developer from dealing with CAN-specific details such as bit-timing and implementation-specific functions. It provides standardized communication objects for real-time data, configuration data as well as network management data. An application designed to operate with USB-CAN on Alekto operates directly on Alena's CAN port, without any changes required. Other Linux applications might use the LinCAN API, which is also available on Alena. This API also supports CANFestival and CANopen. 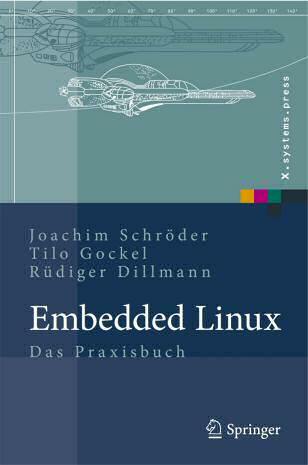 Practical working with Alekto, a member of VScom OnRISC Family, is detailly described in the book "Embedded Linux", authored by Prof. Dr. R. Dillmann, J. Schröder & Dr. T. Gockel, University of Karlsruhe, Germany. It was recently published in Springer-Verlag. Topic of this book is the use of Linux as operating system in modern embedded computers, seen in various devices of everyday use. Linux has been chosen for such systems because even in restricted configurations it provides the use of processes, standard interface drivers, file systems and many more functions available in up-to-date operating systems. The authors did the research on the topic during their scientific work for the Department of Informatik at the University of Karlsruhe. The book is available from Springer-Verlag Berlin Heidelberg, ISBN 978-3-540-78619-1.